DIY Kid's crafts for Dad gifts are always a lot of fun around here. You know we are a crafty bunch, but Dad doesn't want 15 handmade ties or coffee cups. He does love the handmade gifts, but to mix it up we're doing something new today. We are making a Dad's Brag Book and I have a free printable you can download so you can make one too. I'm including this in this month's Craft Lightning Father's Day crafts theme. You can make a brag book for Dad any time of year. You can also spend far more time than 15 minutes on it if you'd like. For the sake of a quick craft, I'll share a quick craft tutorial and some tips for a more detailed book. You choose! What's a brag book? It's a little mini scrapbook kind of craft that you fill with all kinds of things you think Dad might love to brag about. Add in photos, quotes, stories, hand-drawn pictures.. whatever you like. Colored pencils, markers and other coloring supplies. Tip: glue the cover page on to a piece of cardstock to make a more sturdy book. Print the coloring pages at 40% of actual size and use as gift tags. Create your own fun art, jokes, stories and ideas on the blank pages to make a bigger book. Use a blank page to make your own book cover. I hope you have fun with this activity! I have more fun printables and coloring pages you can try. Check out the other Father's Day ideas. 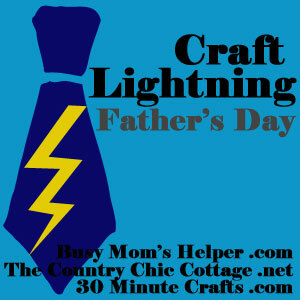 Now go take a look at all the other fun Craft Lightning Father's Day craft ideas. There are so many great crafts you can make in 15 minutes or less just for Dad! Wow, I love this idea and your creativity of the brag book. My son would love to make this or something like this for his dad. One of the best gift for dad I’ve seen yet. Thank you so much. I’m so glad you like the idea, I hope your son has a fantastic time making this gift for dad! Thank you for the note. Love this Jen! Thanks for joining!